Jim Tepper has spent the last 38 years serving the printing and allied industries leading the largest printing association in the Northeast. He joined New Direction Partners in late 2012 following his retirement as the President of PINE, an association providing management information and services for the industry throughout New England. In his role at PINE, Jim provided considerable consulting and guidance to many industry firms regarding growth, market positioning, acquisitions, and establishing and executing exit plans. Prior to his tenure with PINE, Jim was the Director of Conference Services at the Univ. of Massachusetts, Amherst, attracting and overseeing business for their 1,400 acre campus and 150 room Campus Center Hotel. A Vietnam era combat helicopter pilot for the Marine Corps prior to his University position, he continued flying in the Marine Reserves for another 25 years retiring in 1997. Jim received his BA from Springfield College and an MBA from the Univ. of Mass. 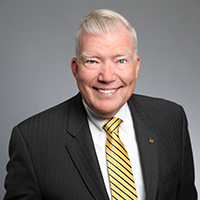 He has served on numerous boards and committees for PINE and the Printing Industries of America, as well as leadership service for his local church, Rotary Club, New England Printing Scholarship Fund, and town youth athletic programs. He is a member of the PIA Ben Franklin Society. Jim has 2 sons and 5 grandchildren.